Cheap Hamilton tickets? Without murdering someone who already has tickets? 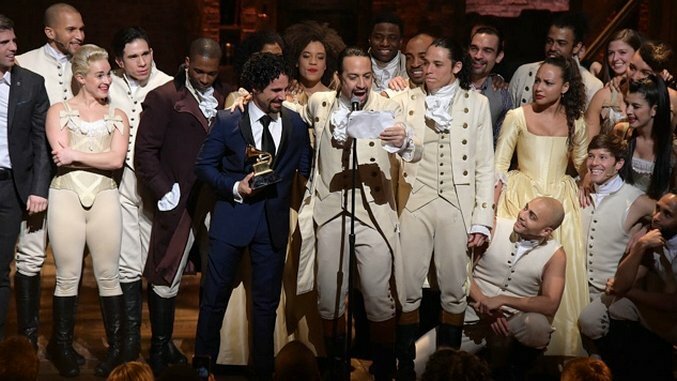 Yes, Hamilton tickets are more expensive than ever thanks to a record-breaking 16 Tony nominations, 11 wins and Lin-Manuel Miranda’s announcement that he’s leaving the show. The cheapest price for a ticket to his final show on July 9 via StubHub is currently $1,667. But fear not. There are other, more economical ways to see Hamilton on the stage. They all take a little luck or a little patience, but you don’t get a win unless you play in the game. Want front-row seats? Each night, 21 of the theater’s best tickets are reserved for winners of the digital lottery. The lottery is open from 9am to 4pm each day. Once you’ve been notified that you won, you’ll have an hour to pay for your tickets ($10 for a single or $20 for a pair). If you’re willing to wait for it, follow Hamilton on Twitter to find out when new tickets go on sale. You’ll have to plan way ahead, but you’ll be paying face value for tickets that parasitic resellers with superfast computers will be gobbling up for profit. Tickets already went on sale this week for the Chicago run at The PrivateBank Theatre. Order as soon as you can as many of the cheapest seats are already sold out. But you can still buy tickets for under $200 to some of the shows. Next year it will head to San Francisco, L.A., D.C., Atlanta and other cities in 2017. Full tour info is here. This one requires being in the right place at the right time, but it worked for me. I went to the Richard Rodgers Theatre about 15 minutes before showtime just to take in the spectacle. I told myself I’d buy a ticket if I could get one for $300 or less. There were a couple people with “Looking for Tickets” signs, but no one selling any. Finally a guy showed up with a single extra ticket, but he was asking $675. Desperate to get inside, he finally sold his orchestra seat for $400. The show started, the cancellation line started to disperse and another guy walked up and asked if anyone was still looking for tickets. He had four to sell for $300 each. I offered him $200, and he resignedly agreed. We walked next door to a reseller counter and I paid with a credit card. The guy said it’s rare that they have unsold tickets, but that my front-row balcony seat had been for sale online moments earlier for close to $1,000. I got to my seat halfway through “My Shot” and spent the next three hours in stunned disbelief. It was the greatest thing I’ve seen on stage. Daveed Diggs’ charisma as Jefferson. The speed and swagger of Renée Elise Goldsberry on “Satisfied.” The commanding presence of Chris Jackson. The hilarious little dance moves from Rory O’Malley. Phillipa Soo beat-boxing while Anthony Ramos sings as young Philip. It’s worth however long in line you have to wait or however much you have to pay. You can also see if anyone leaves during the intermission and buy their ticket cheap. If you’ve already listened to the cast recording, the Second Act is worth seeing on its own. Of course, if winning the lottery seems impossible and face-value tickets are still out of your price range, two nights of the show will be captured on film by the original cast for an undetermined project, along with a 90-minute PBS documentary called Hamilton’s America. I’m sure the finished product will blow us all away.